Please note: this event will be held in Spanish. Simultaneous English translation will be provided for those who need it. Co-sponsored by the Arts Research Center and the University of California Humanities Research Institute, and the Center for Latin American Studies. Diamela Eltit is one of Latin Americas most daring writers and is highly regarded for her avant-garde initiatives in the world of letters. 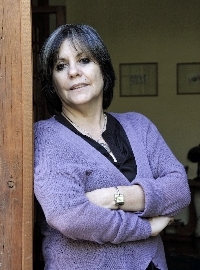 Eltit began her engagement with literature in her native Chile during the years of the Pinochet dictatorship when she participated in the collective CADA, staging art actions against the dictatorship, and published her first novels, Lumpérica (1983) and Por la patria (1986), to universal acclaim. Since then she has published, among others, El Cuarto Mundo (1988), El padre mío (1989), Vaca sagrada (1991), Los vigilantes (1994), Los trabajadores de la muerte (1998), Mano de obra (2002), Jamás el fuego nunca (2007), and Impuesto a la carne (2010). She has been honored repeatedly by international organizations, among them the Modern Language Association in the United States and Casa de las Americas in Havana, and has received fellowships from the Ford Foundation, the Fondo Nacional de Investigaciones, the Social Science Research Council, CONICYT, and the Guggenheim Foundation. Eltit has also held positions as writer-in-residence at Brown University, Washington University in St. Louis, Columbia University, UC/Berkeley the University of Virginia, Stanford University, and Johns Hopkins University. She is currently the Distinguished Global Professor of Creative Writing in Spanish at NYU. ARCs 2018-19 program is a collaboration between ARC Interim Director Natalia Brizuela (Film & Media and Spanish & Portuguese), Tarek Elhaik (Anthropology, UC Davis), Anneka Lenssen (History of Art), Leigh Raiford (African American Studies), and Poulomi Saha (English), supported by a generous grant from The University of California Humanities Research Institute (UCHRI). The years investigations on art and critique from/in the Global South will take off with a Workshop in Mexico City (September 6-8), co-convened by Natalia Brizuela and Elena Tzelepis (University of Thessaly, Volos, Greece), organized through the International Consortium of Critical Theory Programs (ICCTP) with the support of the Andrew W. Mellon Foundation. The Mexico City workshop will take place at the Museo Universitario de Arte Contemporáneo (MUAC) at the UNAM. More details on the Mexico City workshop can be found here. This project was supported in part by the University of California Office of the President MRPI funding MR-15-328710.